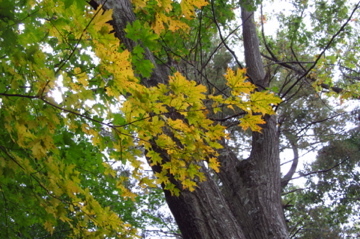 Maple trees are deciduous, which means they lose their leaves in the fall. If you look carefully, you should be able to find red maples (Acer rubrum), sugar maples (Acer saccharum), and Norway maples (Acer platanoides) on this trail. Maple leaves grow opposite each other on the twigs. They are palmate, which means they resemble a hand with lobes mimicing fingers. The leaves can have varying numbers of lobes depending on which kind of tree it is. On red maples there are only 3 main lobes. 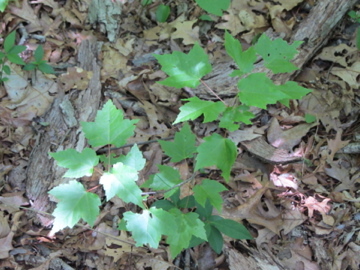 Both sugar and Norway maples have 5 clearly separate lobes. The outside edge of the leaves is serrated. 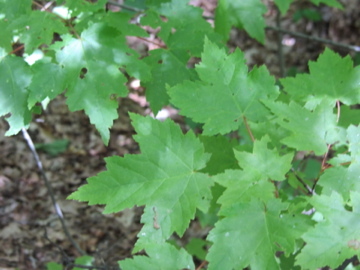 Red maple leaves are smaller than sugar and Norway Maples, only growing to about 2-4 inches. 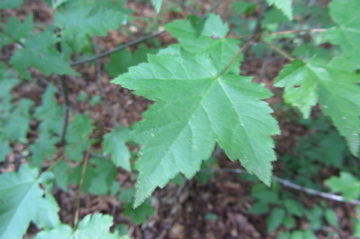 Sugar and Norway Maple leaves grow to 8 inches long and look a lot alike. 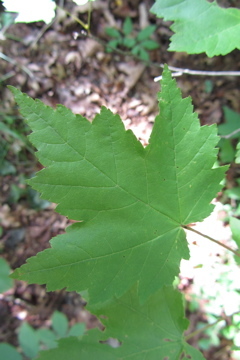 Sugar Maple leaves are about as wide as they are long. 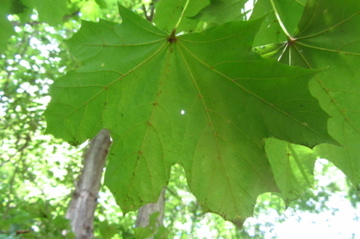 Norway maple leaves, however, are wider than they are long. Maple seeds are about 1/2 inch to 1 inch long, and usually grow in pairs. They look like they have a wing growing out the side. When a seed falls off the tree, the wing flutters in the wind and can help the seed fall farther away from the parent tree. Red maples and sugar maples are native to North America. Norway maples are invasive. They come from Europe. 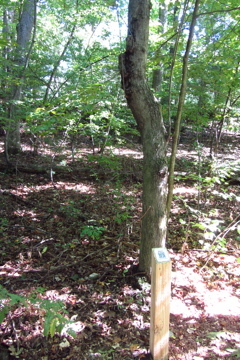 They are gradually crowding out other native maple trees. Their sale has been banned in Massachusetts and New Hampshire.